"I offer my obeisances to Sri Caitanya Mahaprabhu, by whose mercy even an ignorant child can swim across the ocean of conclusive truth, which is full of the crocodiles of various theories. "O my merciful Lord Caitanya, may the nectarean Ganges water of Your trancendental activities flow on the surface of my desert-like tongue. Beautifying these waters are the lotus flowers of singing, dancing, and loud chanting of Krsna's holy name, which are the pleasure abodes of unalloyed devotees. These devotees are compared to swans, ducks and bees. The river's flowing produces a melodious sound that gladdens their ears. 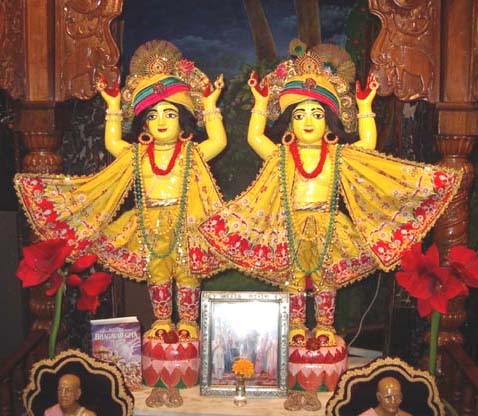 "All glories to Lord Sri Caitanya Mahaprabhu and Lord Sri Nityananda. All glories to Advaitacandra, and all glories to the devotees of Lord Gauranga."